The promotions below are available throughout the year at various times. Please contact us with questions regarding any of our special promotions for your upcoming visit to Petoskey. No matter what season, Bay Inn of Petoskey is always planning something special. Call 231-347-2593 to discuss current promotions or special rates on the private Guest Cottage. 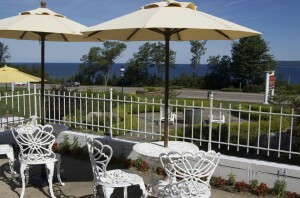 Enjoy a special seasonal promotion where your fourth night at Bay Inn of Petoskey is completely free. Book four consecutive rooms nights and you will pay for only three of the four nights. Ask us about details for this great cost-saving special. Free night applies to lowest priced night’s stay. Subject To Availability Black-Out Dates Apply. Stay with Bay Inn of Petoskey and enjoy discounted golf at any of the neighboring Boyne properties, Bay Harbor Golf Club, Crooked Tree Golf Club, Charlevoix’s Belvedere Course, Little Traverse Bay Golf Club and Hidden River Golf & Casting Club. Enjoy world-class golf at near-by courses throughout Petoskey, Boyne Falls and Harbor Springs. Available June – September only. Guests of Bay Inn of Petoskey receive a voucher valid for ½ off breakfast or lunch at the Waas-no-de Buffet at the the near-by Odawa Casino Resort. Guests will further enjoy a $5 free slot play for extra fun at the casino. Get into the gaming action during your stay with a visit to the fabulous Odawa Casino Resort. Visit the Bay Inn of Petoskey during the winter months and take advantage of special lift ticket discounts at any of the local resorts including Nubs Nob, Boyne Mountain, and Boyne Highlands. Enjoy first-class and friendly skiing at the best resorts in the Midwest. Available during ski season only.